Chaidh deasbad a chumail air ais anns a’ Ghiblean mun Phlana Cànain Nàiseanta Gàidhlig. Tha sinn a-nis air eadar-theangachadh a dhèanamh den deasbad air fad dhan Ghàidhlig. Tha na h-òraidean a rinneadh sa Ghàidhlig ann am faclan a chleachd na BPA fhèin, ach tha sinn air Gàidhlig a chur air na h-òraidean anns a’ Bheurla. 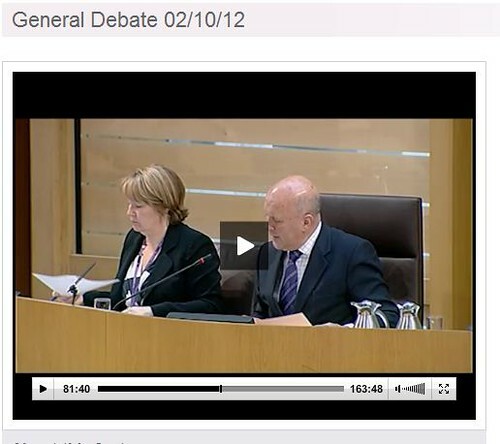 A debate was held in the Scottish Parliament yesterday about the National Gaelic Language Plan. Amendments were put forward to the motion by Liz Smith MSP (Scottish Conservative and Unionist Party) and Iain Gray MSP (Scottish Labour). Some of the members spoke in Gaelic, including Kate Forbes MSP and Alasdair Allan MSP who both delivered full speeches in Gaelic and others used sentences or phrases in Gaelic including John Finnie MSP and Rhoda Grant MSP. The members discussed various subjects including Gaelic medium education, economic development in Gaelic communities and Gaelic broadcasting. You can read the Official Report of the Debate or you can watch the video on our YouTube channel. Tha an deasbad a’ tòiseachadh aig 81 mionaidean. Airson làn aithris air an deasbad, faic bloga an latha an-dè.